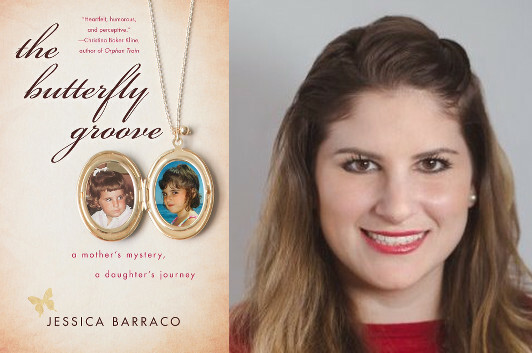 As Jessica Barraco says in the book trailer to her memoir, The Butterfly Groove, she always knew who her mother was—but because her mother had died when Jessica was still a young girl, there were many unanswered questions about the past that had made her who she was… and that’s what Jessica set out to investigate. In this guest essay, she explains how she hasn’t just filled out her understanding of her mother’s life; she’s also gained a richer understanding of how her mother continues to be a presence in her own life. One year for a birthday present, someone gave me a vintage album of my mom’s favorite song: “Cherry Bomb” by John Mellencamp. It was beautiful, and such a collector’s item. The original recording happened to take place during the year and month I was born: August of 1987. It was meant to be a sweet gesture, but the truth was, my heart sunk and my eyes filled with tears, and I couldn’t understand how such a nice gesture could make me feel so distraught. The whole next day, I learned a harsh reality to losing my mom at twelve years old: Every happy moment in my life will be bittersweet. No matter the joy, it will inevitably sink in that my mother will not be there to enjoy whatever it is with me; to see me grow, to watch me smile; and that no matter how you slice it, that is so very sad. Always being an ambitious person both personally and professionally, I often pictured milestones: my first job, book release, wedding, birth of my children. And I can’t think of any of these moments without seeing the obligatory empty chair that my mom should be filling. The daily phone call I don’t get to make that so many others take for granted. The reassuring glance I have almost forgotten. I can get easily overwhelmed imagining any one of these moments. My mom passed away sixteen years ago after suffering from cancer and its horrendous complications for nearly twenty years of her life, and for all of mine. I learned a lot about my mom while researching and writing The Butterfly Groove, but I was also able to imagine how she handled her own life’s milestones. I am comforted by now knowing the true series of events in her life that I wasn’t aware of previously. Along with the truth, I was fortune enough to learn how these experiences both inspired and influenced her choices: whether positively, negatively, or seemingly not at all. I call it learning the emotional genealogy of a person. I always knew where I came from, but I wanted to know from whom I came from. I have found as my life moves closer to “we” instead of I; as my own family grows, it is inexplicably more difficult to deal with loss. Love has a psychological correlation to loss, and anyone who isn’t aware of that and has suffered a great loss, should realize that now. Your brain can try to fool you into thinking the sadness should mask the joy. But the key is to finding the medium of emotion between those two feelings, and sometimes even getting ahead of them. Being aware that the bittersweet feelings are likely to come, can help in the moment of joy. You never really know for sure until the moment passes. I will find out soon enough at my wedding, taking place later this year. I always struggle with the sad reality that not everyone you love will live during the same years, and be in the same time and space when you become the next version of yourself—a husband, a wife, a mom, a dad, a teacher, an aunt, an uncle. But those people have helped make you who you are, so that you could be in this moment, so again, it goes back to not who’s missing, but who has been there and who is there now. They’re equally important. I find this very part of me makes me a very logical individual. I am immediately able to see the heart of a situation. I am able to find a solution, not make problems in matters of life. I don’t sweat the small stuff. My head defaults to, “At least I am alive, at least I can be at this place.” Compared to all of the many individuals who I wish could be there for me, but are not in this realm. I will never accept that it is fair that my mom will be missing from my upcoming wedding, and since in highly emotional situations it’s easy to get overwhelmed and distracted from the present moment, I am going to honor her by filling that empty chair in the front row I have always dreaded, with a dozen roses to remind myself, and my guests, that I have a mom, and she is here—and her exact location is not important. What’s important is what I gained from being her daughter, and how that has influenced my true journey to reach this milestone. And that makes me smile.